You've missed to mention the brand new set of cool ringtones & text tones! I am sure this deserved to be mentioned in your review! AnonD-45523, 17 Sep 2013iphone's idea of smooth OS...make the animations a bit longer..:(Android is getting smoother and IOS 7 is making the device slower? Wtf?? Dark grey keyboard? Copying Samsung, I see. AnonD-27765, 18 Sep 2013Apple's Appstore is the most lucrative app store in the world with 10 biilion dollars already ... moreAlso devs only have to develop once for IOS whereas Android there are so many iterations etc. Tried all the latest ios mobile and best android devices but im sticking with my lumia 925. The os is so fluid. Transitions are perfect. Apps getting better each day. Beside i always stand out outside because of my unique interface. Injust love the well crafted execution of everything. Loving my lumia 925. What is the use of wallpaper that is always covered by icons. Your face is covered by icons, that is silly. They should bring wallpaper only after they have home screen. Tom-Helge, 18 Sep 2013Doesn't help when iOS is tiny small compared to Android in any ways. That's what counts. Do... moreIt's not that easy to create an app for Android specially games since it's hardware specific. As if 79% of those users can use the same app. It will lag on low to midranged phones. Tom-Helge, 18 Sep 2013Doesn't help when iOS is tiny small compared to Android in any ways. That's what counts. Do... moreApple's Appstore is the most lucrative app store in the world with 10 biilion dollars already paid to developers compared to a measly 300 million dollars devs got so far from the Google Play Store. Devs get more money for releasing their apps on iOS than on Android that's why their priority is iOS and Android only gets a third-rated, iOS-ported apps. AnonD-27765, 18 Sep 2013That whole 19% marketshare of iOS consist of all highend devices compared to Android's 79% whi... moreDoesn't help when iOS is tiny small compared to Android in any ways. That's what counts. Do you think i would create an app that i want to get paid for or even create it for free to 19% of the smartphone users or the side who have 79% smartphone users today? Tom-Helge, 18 Sep 2013You meant by no one. 19% marketshare that Apple have against Android's 79% marketshare in t... moreThat whole 19% marketshare of iOS consist of all highend devices compared to Android's 79% which are mostly cheap midrange and entry-level phones. iOS wins, as usual. Anonymous, 17 Sep 2013The most advance, & innovative OS loved by everoneYou meant by no one. 19% marketshare that Apple have against Android's 79% marketshare in the world. Oh also, the most advanced mobile OS is not iOS, because it's the most dumbed down OS in the world if you compare it to Android or Ubuntu Touch. And if iOS 7 is innovative, then what the hell is Android 4.3 and the Android ROM Samsung uses on it's Samsung Galaxy devices? iPhone 5C and 5S is the first phones to have 64-bit hardware support though. The OLD UI looks much better then the new iOS 7 including the Icons and most of the system app pages. GSMArena, you should now start adding video reviews in your site. It's more fun watching hands-on videos than reading a 9-page long review. IPhone 5C is already having better start than iPhone 5 which was current record sell holder. "Citi Research analyst Glen Yeung said Monday night in a note to investors that pre-sales of Apple’s new iPhone 5c likely came in at around 2.2 million units during the phone’s first 24 hours of preorder availability, CNET reported. That figure would mean that 5c preorders topped the 2 million units Apple’s iPhone 5 racked up last year during its first 24 hours of pre-sales. 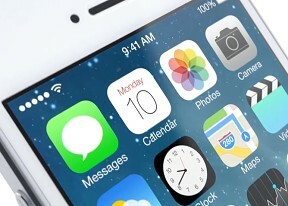 Yeung didn’t suggest any answers to that obvious query, but he did estimate that combined global iPhone 5s and iPhone 5c sales through the end of launch weekend will likely total about 7.75 million units, handily topping the 5 million iPhone 5 handsets Apple sold during its opening weekend last year. As for the split, the analyst thinks 5c sales will total 4.5 million units while sales of the more expensive iPhone 5s will reach 3.2 million units."